Also, Comfybuns Custom Cloth Wipes has extended their 500 Fan Celebration til tomorrow! So you still have a chance to enter & win the 'Apple a Day' bib & plushie set! Thanks for linking up with the Terrific Thursday blog hop and folllowing my blog! Have a great day and happy blog hoppin'! Hi. Visiting from the Terrific Thursday Blog Hop. I am your newest follower. I look forward to reading your blog. Please stop by and visit mine. Cute bibs. Thanks for following. Have a great day! I am following you now too! Thanks for the follow and joining our new Terrific Thursday Blog Hop! Have a great weekend! Browse through my monster-friendly lipbalms, soaps, & more on Etsy! 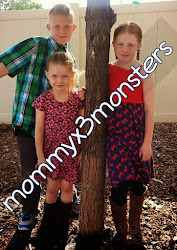 Momx3, military spouse, craft addict, & part-time blogger.